Welcome to Jesus Welcomes the Children, our story for February 17, a script I’ve written to share the scripture from Luke 18:15-17. The story script also alludes to several other stories from the Bible in which children play important parts, hopefully helping our children understand more of what Jesus is saying is important about how children think, love, believe, and trust. I’ll include the script below, in case teachers from other churches would like to use it. (Just scroll down to the end of this post.) It’s been exciting for me to see our extra stories be used in churches all over the world! I hope this one works well for everyone. 1. Children could celebrate Jesus welcoming the children by doing a collage of children’s faces from magazines. (There’s a big box of them in the art resource room near the door.) They could write the verse from Luke 18:17 at the top. Or make a mural for your class, where each child draws themselves! 2. Children could make a puppet of themselves from a paper bag. We have lots of yarn for hair and fabric and all sorts of other things they could add. Could you video your kids using their puppets to sing Jesus Loves Me? 3.How about make a version of this? It comes from Growing Kids in Grace. Children could write their own caption, using scripture or their own words. 4. 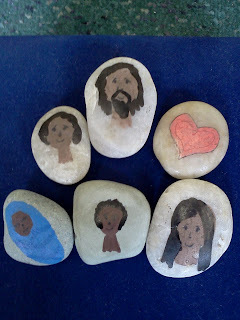 How about letting the kids make story stones for Jesus and children- and maybe a disciple or two or parents. This idea comes from Flame: Creative Children’s Ministry. Or you could make characters out of play clay or clothespins. Or whatever else kids think of! 5. You could always act out the story. My camera is on the blink right now, but if you have an iphone, send me the video and I’ll upload it for parents to see. 6. Older children might want to research Bible stories about children, and then share them with the class. You can find more art response ideas at my Pinterest site here. Whenever Jesus came to a town, people wanted to go see him. Add Jesus figure to the underlay. If their bodies had sicknesses or if their hearts or minds were sick or sad, they hoped Jesus could heal them. They wanted to watch Jesus heal others and to hear Jesus’s stories about what is important to God. One day when Jesus came to town, the people were very excited. They put down their work to go and be near him. Moms and dads wanted their children to see Jesus too. If Jesus would only touch them, how special that would be for their children! So they brought their children to the crowd around Jesus. But Jesus knew how important all children are. Jesus knew children could think important things and do important things, like loving and trusting. I wonder if he thought of all the stories he’d heard in the temple about children, like the one about the little girl who was taken from her family in Israel as a slave. When her master, Naaman, was sick with leprosy, she believed that God’s prophet Elisha could heal him. She suggested Naaman should go to Israel and see Elisha, and even though she was just a child, Naaman did what she said and he was healed. I wonder if he thought of Samuel who served God in the temple, even as a little boy. I wonder if he remembered the way Miriam, the big sister of Moses, followed her mother’s directions and put Moses in a basket in the river and stayed nearby, when the pharaoh said all Hebrew boys had to die. When the princess found him, Miriam suggested the princess take him as her own and have Miriam’s mother be his nurse. I wonder if Jesus thought of the little boy who offered to share his fish and bread with the hungry crowds who had come to hear him, and with Jesus’ help, there was enough food to feed thousands. Jesus knew how children think and love and believe and trust– how each of you think and love and believe and trust. He thought it was the best way to be of all. Jesus saw the disciples shooing the children away and stopped talking to the adults so that he could call the children back. Add children around Jesus figure. 1. I wonder what is your favorite part of this story. 2. I wonder what God loves most about you. 3. I wonder what God loves about the way you think and believe. 4. I wonder what God would like adults to learn from children.